Kallirrhoe Kourea, MD is a Cardiologist, PhD of the University of Athens with special interest and specialization on the change of lifestyle for the prevention of cardiovascular diseases. 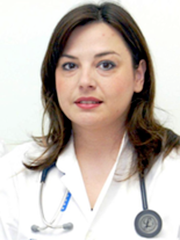 She is an active member of the Prevention and Rehabilitation Working Group of the Hellenic Cardiology Society and the European Society for Cardiovascular Prevention and Rehabilitation for Cardiovascular Prevention and Rehabilitation (EACPR). Graduate of the Medical School of the University of Ioannina, with specialization in Cardiology at the 2nd University Cardiology Clinic of ATTIKON Hospital and doctoral dissertation on heart failure. Currently she works as a Cardiologist at “Hygeia Melathron” Cardiology Clinic, while she is also a University Scholar at ATTIKON Hospital, where she is in charge of the Smoking Cessation Programme of the 2nd Cardiology Clinic. She has an active participation in many scientific meetings in Greece and abroad with postings, oral presentations and speeches. She is certified by the NCSCT (National Center for Smoking Cessation and Training) of NHS for practicing smoking cessation. He has a teaching experience in postgraduate programs of the University of Athens at ATTIKON Hospital and the National School of Public Health (2009-2018).